"The Built From Scratch Apparatus" is the general title for a series of projects by Pierre Gordeeff initiated in 2006. Composed of parts salvaged from the trash, yard sales and equipment purchased from bankrupt hospitals, schools and factories, Gordeeff's work has slowly evolved into an ornate sculpture and light show along with amplified moving parts fed into a mixer. 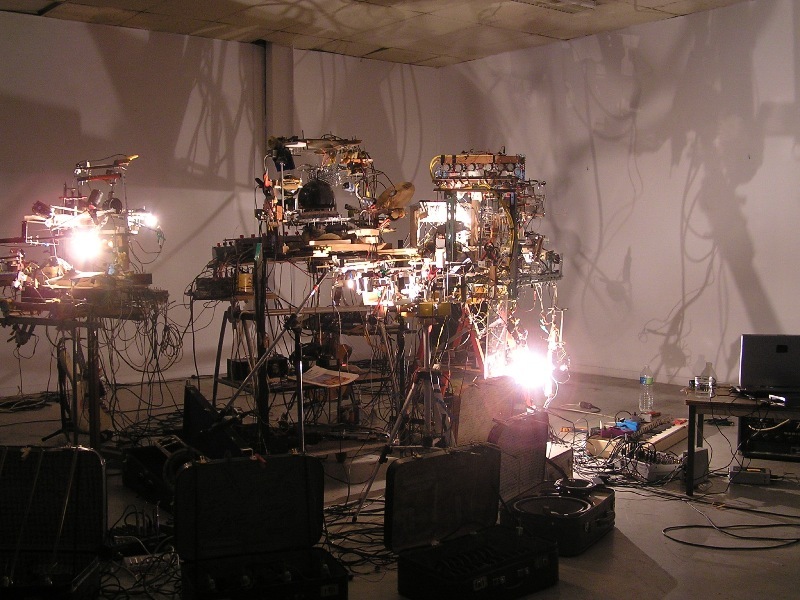 This particular configuration of The Built-From-Scratch Apparatus, La Trombe, is performed alongside a duo with electronic musician Boris Jacobek on laptop and Bontempi keyboard. PIERRE GORDEEFF - LA TROMBE / Juin 2008 / GRRRND GERLAND from Grrrnd Zero on Vimeo. La Trombe was built specifically for a performance at Lyon, France's DIY venue Grrrndzero and this video was shot during one evening of La Trombe's installation period at the space in June of 2008. Although it seems that throughout most of this improvisation the sculpture is obscured in shadow, spectators could observe the well-lit sculpture before and after the performance. Initially, Gordeeff's pieces were a less complex juxtaposition of drawings, sculpture and found objects, often depicting images of dystopian angst. By 2004, he began to make use of light and motion as his work became more performative. He eventually added sound by amplifying various moving portions of the sculpture and in his recent musical performances, the process of obscuring and illuminating portions of the sculpture "becomes more detailed than if I were [merely] drawing or sculpting it." When asked about the sculpture's transformation into an improvisatory musical instrument, Gordeeff observes, "I used sound and motion as a tool to overcome my habits of plastic composition. I followed the technical bias of all the items I could find [rather than my own aesthetic decisions] to end up with hybrid objects and shadows of elaborate graphic design. Sometimes sound inhabits space in a more present manner than a volume." This heavy reliance on the innate qualities of salvaged objects along with a compositional method employing engineering and physical principles mesh well with Gordeeff's sociological concerns. As Gordeeff waxes in an artist's statement on his website, "The consumer today is far from necessity. We have a myriad of objects for functions more or less futile.... We produce more and more objects that last less time. Here we will address the abandonment of the object rather than repair.... I try to question our system of assessments, our scale of values for the useful, the necessary....."
Other notable works using different configurations of the Built From Scratch Apparatus include Jean Pierre, a collaboration with Jean Barbier on prepared electric bass, high-pitched machine and voice, as well as Prudeeff, a duo with saxophonist Mathieu Prual. Many recordings from Gordeeff and his circle are available for free download under Creative Commons license from the Aposcaphe label's website. See below for a mix of Gordeeff's recordings, from the Free Music Archive. Nat Roe is a DJ with WFMU and the editor of WFMU's blog. He has contributed in the past to Wire, Signal To Noise and the Free Music Archive. Nat also cooperatively manages Silent Barn, a DIY venue in Ridgewood, Queens. Special thanks to Loic Guilmard for translation help.